We will only collect your garden recycling if you display a yellow sticker. If you have a contract we will contact you when it is time to renew. If you are new to the scheme you can sign up for a contract now. You must purchase a Richmond garden bin, if you do not already have one. Your contract will run from 1 May 2019 to 31 October 2019, but you will receive a sticker within 10 working days. You can begin using the service as soon as you have your sticker and bin. To join this service you will need to pay for a subscription and buy one of our garden recycling bins, if you do not already have one. Once you have joined, your garden recycling will be collected from your property every two weeks. You will be sent a special sticker to place on the side of your bin. This will let our collection crew know that you have subscribed to the service. Be sure to check what you can recycle before you subscribe to this service. Your contract will begin on the first day of the month, following your completed application. All contracts run until 31 October. You will need to own a council garden recycling bin and pay for a garden waste subscription. 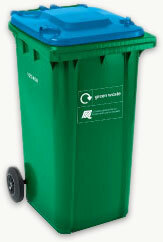 You must own an official council bin (green bin with a blue lid - as pictured). If you already own a council bin you do not need to buy another. A larger 1100 litre bin is available for £260 per year for blocks of flats. You will need to contact us for an assessment before you can subscribe to this service. Please let us know if you are moving so that we can amend or remove your details. You can cancel your subscription at any time. Refunds cannot be issued for early contract cancellation. You can report a problem with your bin or collection if you are unhappy with the service. You should read our garden recycling service terms and conditions before you subscribe.